Where's this Anna Marie/Johnny friendship come from? I'm not complaining, I'm wondering where it started. And Rogue did steal Johnny's powers once, in the FANTASTIC FOUR/X-MEN miniseries. 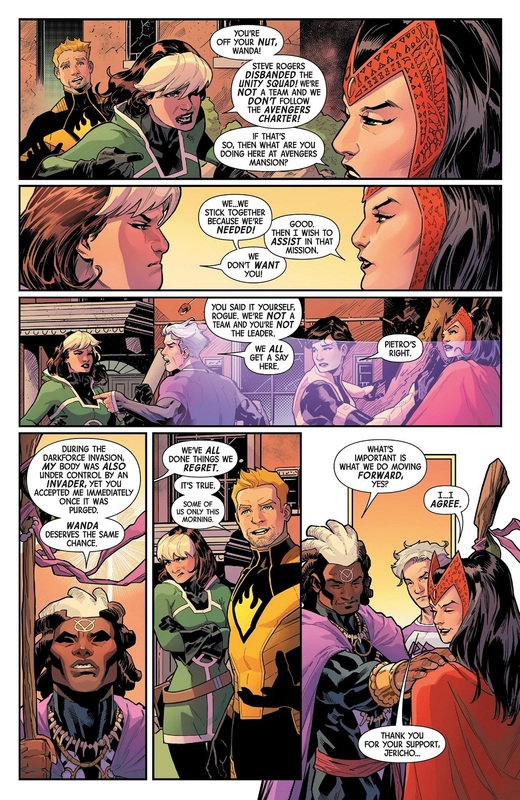 In the post secret wars time skip, I'm pretty sure there was an allusion that they dated before he hooked up with Medusa. 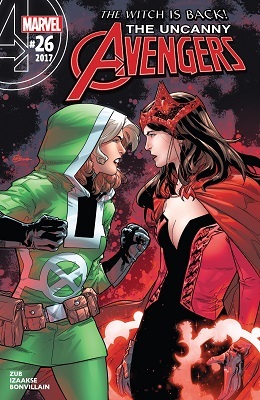 Wanda and Rogue got along great after Remender's run wrapped up, I feel like that was just completley ignored. 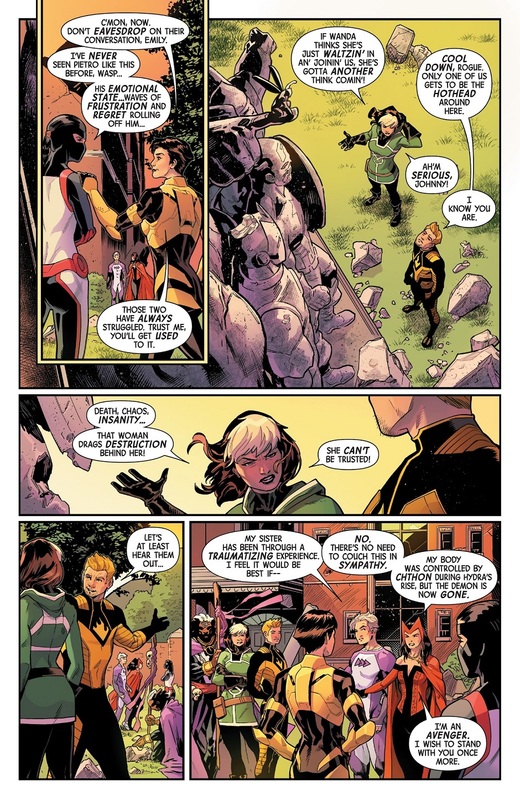 Plus Rogue's being awful judgy for somebody with her sketchy past. Like the X-Men are just full of squeaky clean, White Knight paragons. Can Rouge not control her powers anymore? When did that happen? I have no clue. As best I can tell it happened when Wonder Man got stuck in her after she fought the Celestial or when the High Evolutionary cut him off from her conscious mind. But that was before Secret Wars and the 8 month timeskip that happened after. 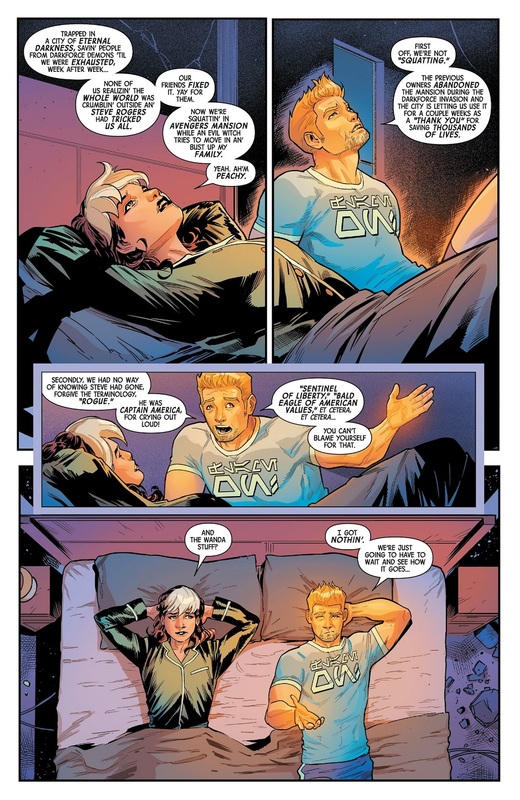 As stated above she apparently dated Johnny Storm before he hooked up with Medusa, of course that doesn't necessarily mean they touched. 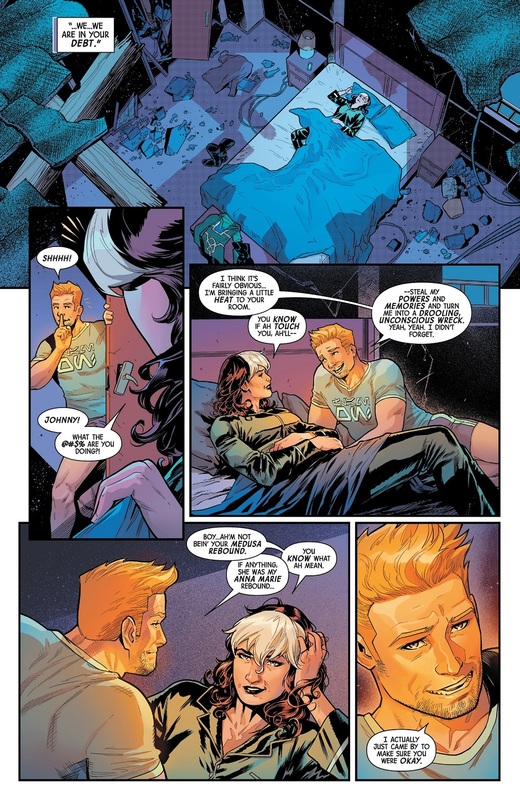 I do recall her trying to kiss Gambit (who turned out to be the Red Skull in a telepathic illusion) so unless she wanted to steal his powers and knock him out... She also kissed Deadpool and did end up stealing his powers. So they're not going to explain why Chthon sided with Hydra? Basically, you're saying there was no good reason. Chthon isn't the minion type after all and he didn't do much chaos. except that fascist regimes tend to result in chaos, even as they try and force their own order on the world. You're really reaching here. Chthon wouldn't act as someone's lackey and he wants to rule over and/or destroy everything for himself, he wouldn't work for mortal. He was out of character and it was a lazy way of having another "brainwashed Wanda" story, even though her recent solo was meant to move away from that. Basically, it was a poor choice all around. I really like this version of Johnny, he's more mature than the FF often let him be, yet still fun loving. And I like his report with Rogue. Don't ship it, but I like this Rogue/Johnny friendship. It's cute. As is Johnny. Love the haircut, and really digging the facial hair. A missed opportunity for her to tell him that his one true love is Peter Parker! Johnny's one true love is axle grease. Peter helps him with that. And since they were roommates there MUST be a time they ended up naked in bed together. Accident my foot! What are the characters on Johnny's shirt? It's the alphabet that Star Wars uses for Galactic Basic. There's a translation key on Wookiepedia. Translated, it's "Flame On."